What are the fundamental technical, design and social challenges presented by an aware home? 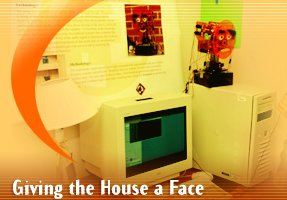 The Aware Home Research Initiative (AHRI) is an interdisciplinary research endeavor at the Georgia Institute of Technology that addresses challenges facing the future of domestic technologies. A unique and critical resource in this activity is the Georgia Tech Broadband Institute Residential Laboratory, a three-story, 5040-square-foot home that functions as a living laboratory for interdisciplinary design, development and evaluation. The research agenda of AHRI spans four complementary themes. We design interactive experiences appropriate for people in an aware home environment; particularly enabling older adults to age in place. We develop the building blocks to create highly distributed sensing and perception technology, developing awareness of human activity in physical environments. We address the software construction challenges of engineering a robust and reliable bridge between the designer’s intent for interactive experience and the technology itself. We explore the social, political, legal and economic benefits and concerns related to privacy and autonomy when services exploit awareness and knowledge of human activity within the protected space of a home. Some of the projects featured on the Aware Home tour maybe found in the 2006 Project Descriptions. Many of us want to keep in touch with family members who live far away from us. This need can turn to concern for elderly family members who live by themselves. 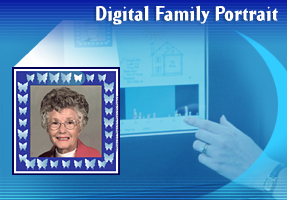 Projects such as the “Digital Family Portrait” and “Dude’s Magic Box” seek to improve social communication between extended family members. Everyday life is full of short, medium and long term memory issues. In the case of daily household tasks such as cooking, short and medium term lapses can be a significant distraction. Iirrevocable memory lapses can occur, such as “Did I add the baking powder to the brownies?” Or, “Where did I put that bill?” Projects such as the “Cook’s Collage” and “Finding Lost Objects” are researching how to assist users in resuming interrupted activities. In the case of long term memories we are looking at ways of enhancing people’s ability to capture, archive and the then access memories of everyday life. Projects such as the “Living Memory Box” and the “Family Video Archive” are developing techniques for the semi-automated tagging of context with multi-media memory artifacts. Remote controls, with tiny buttons, complex interfaces, and an uncanny ability to get lost in the couch are part of everyday life. Imagine instead controlling your home appliances with a wave of your hand. Several projects are addressing the area of devices in everyday life. 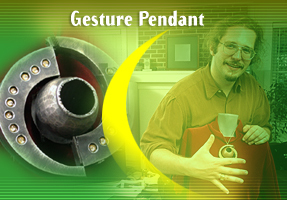 The “Gesture Pendant” recognizes, and then translates gestures into commands for your home appliances. Our “Context-Aware Universal Remote” helps people to control multiple devices throughout the house via one remote device. The research into Blood Glucose Monitor devices seeks to provide accurate and timely assistance to those performing self-testing in the home. A principle component of an aware environment is knowing where the people are located. We integrate a variety of technologies throughout the home space, which range from relatively simple and robust low-resolution strategies, such as RFID, to more sophisticated and higher resolution, state-of-the-art computer vision solutions. While it is possible to engineer sensing systems to detect specific events (e.g. a fall), we are developing activity recognition methods to monitor the general activities of the occupants. This awareness includes low-level tasks such as reading a newspaper or watching TV, and higher-level tasks such as preparing a meal, or using a blood glucose monitor. • Controlling multiple distributed displays. It is a challenge to simplify how the information gleaned from a variety of sensors is made available to application developers – the who, what, where, when and how of everyday life. We are developing and refining the “Context Toolkit” to support rapid prototyping of home applications that leverage knowledge sensed from the environment. Many of the services being designed for the Aware Home involve retrieving recordings or images from past activities. We are developing generic support (INfrastructure for Capture and Access, or INCA) to assist in building applications that involve capturing live experiences and making them available for later access. • Impact of Industry standards (e.g. uPnP) on aware environment infrastructure. Sensing devices deliver enhanced services by collecting raw data about people and transforming that data into high level information about human activity. Working from legal precedence, we are assessing privacy concerns raised by the collection of the data, the information produced, and the dissemination of that information to other people in other times and places.